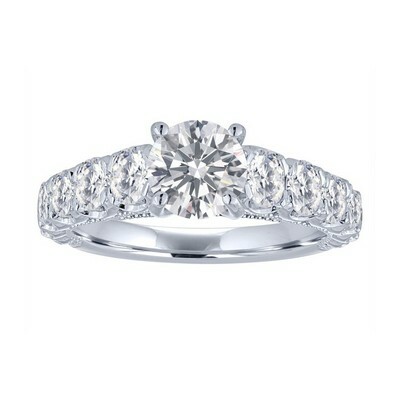 Part of our Prestige collection, split shank halo ring sits low on the finger. Beautiful straight baguette side stones. 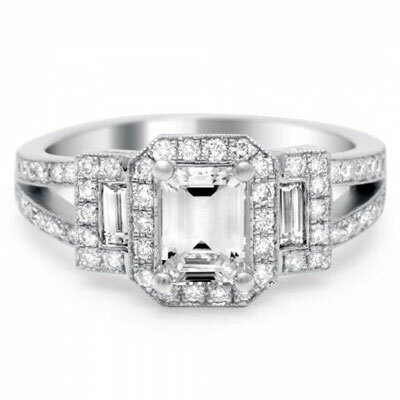 Center stone is made to fit an emerald cut diamond .65 ct TW. 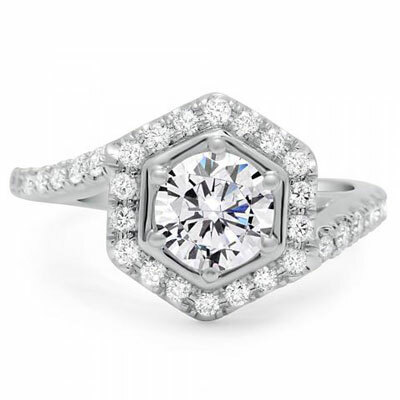 Art deco style hexagon shaped pave halo ring contains .55 carats of diamonds and an interesting "bypass" shank. Custom made matching band carved out of wax to fit together perfectly with customer's engagement ring. Wedding band features 0.24 carats of diamonds. 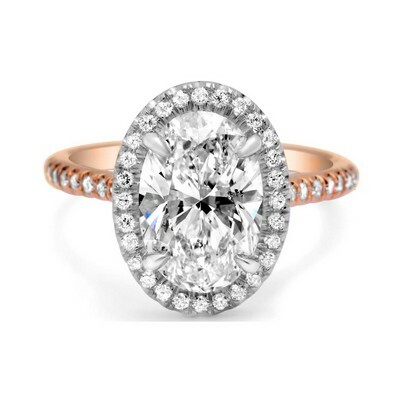 Beautiful two tone pave diamond halo oval ring features 0.10 carats of diamonds in a rose gold setting and a comfort sheen shank. 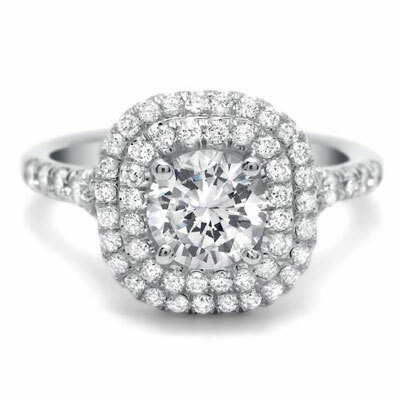 Part of our Prestige collection, this bezel set marquis halo engagement ring has a split shank and contains .39 ct TW of round diamonds. 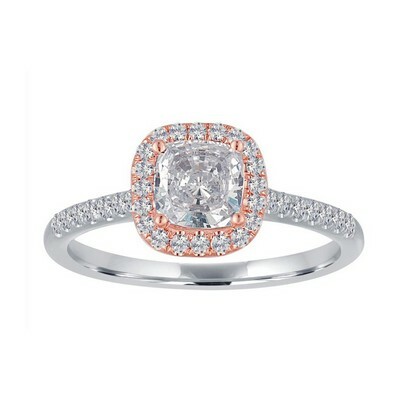 We call this our Shyla solitaire. This version has 2 pear shaped blue sapphires (.32 carats) trimmed in milgrain and is made to hold a pear shaped center stone. 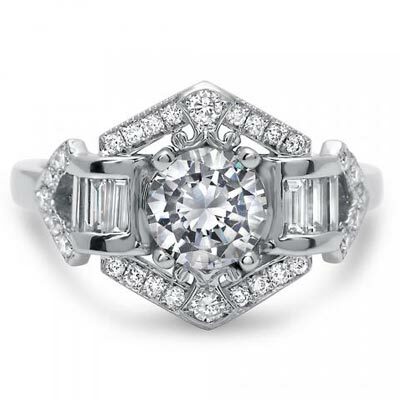 The hexagon shaped art deco style halo, 6 diamond baguettes, scrollwork, and gallery make this ring extra special. .87 ct TW of diamonds. 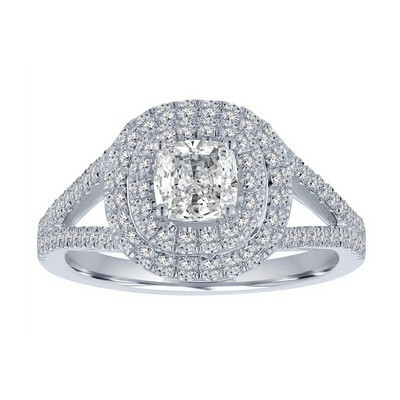 This breathtaking double halo ring features 0.62 carats of pave set diamonds. 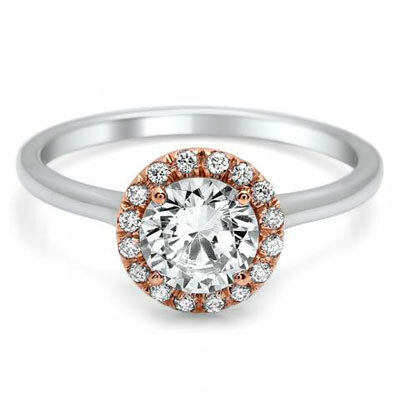 from our Sweetheart collection. 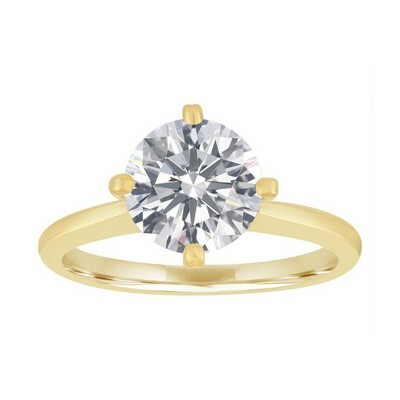 The Allison Ring. 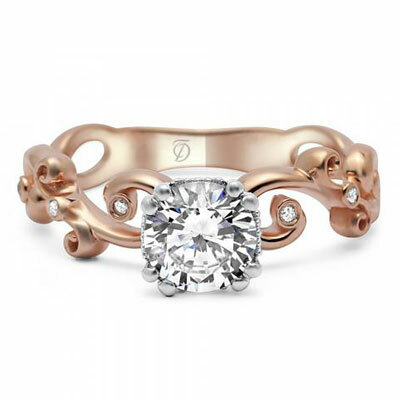 A beautiful addition to our Sweetheart collection, featuring an ultra feminine open scrollwork design and 0.03 ct TW of brilliant round diamonds. 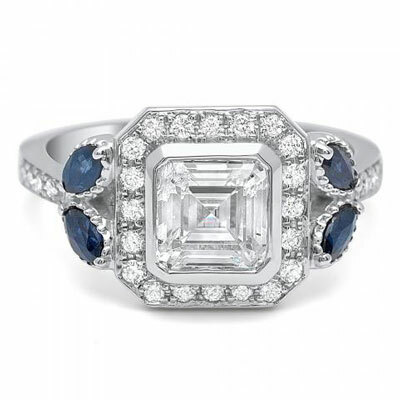 Pave square halo ring is adorned with 4 blue sapphire marquis stones (.32 ct TW) and .30 ct TW of diamonds. 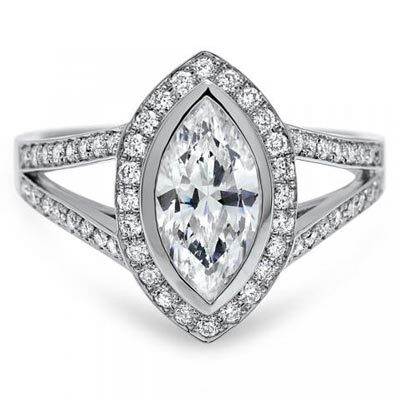 Art deco style pear shaped pave halo ring is part of our Shyla collection. 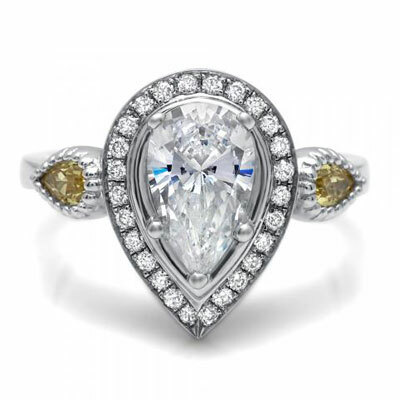 This version is trimmed with milgrain and has 2 pear shaped yellow sapphire side stones. 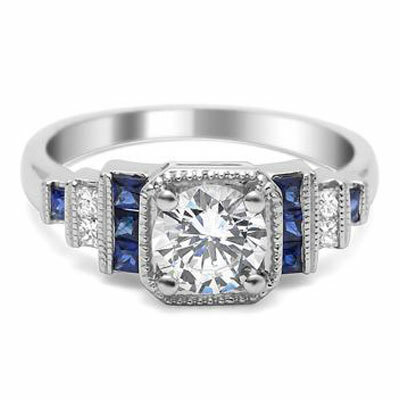 Diamond and sapphire engagement ring with vintage stairstep design from our Legacy Collection. 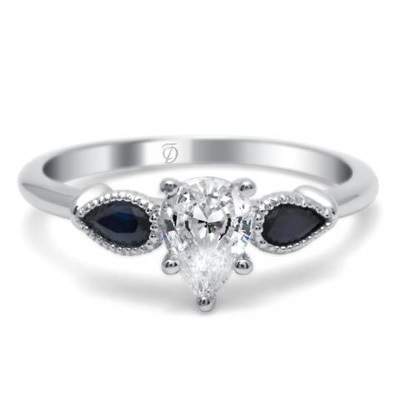 Features milgrain and 0.12cts diamonds, 0.35cts sapphires. 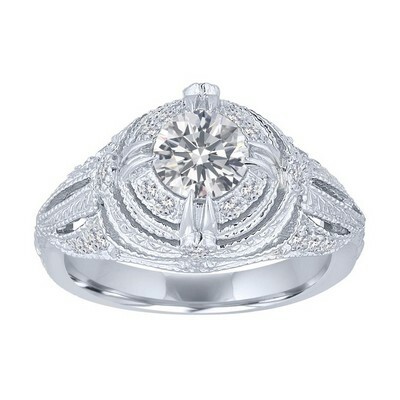 Double pronged milgrain cushion head holds your favorite round center stone. 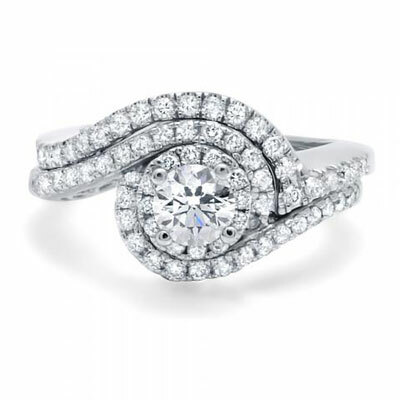 Pear shaped diamonds are nestled between the diamond and engraved split shank. .45 ct TW of diamonds. 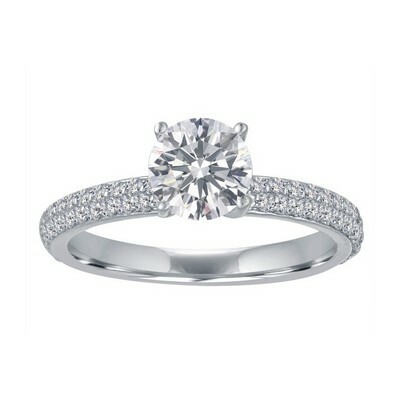 Halo ring from our Legacy collection has a beautiful stairstep design and polished shank. Contains .20 ct TW of diamonds. 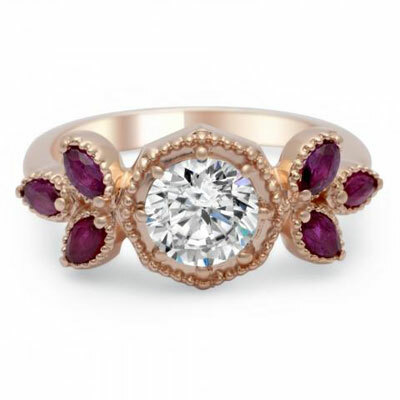 Feminine floral rose gold and ruby ring (0.60 ct TW) with milgrain and 8-prong hexagon shaped head. 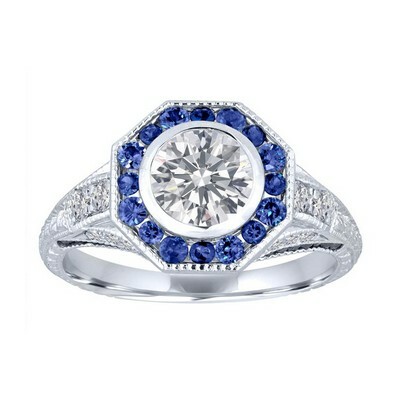 Available in any size or shaped center stone. Part of our Shyla collection. 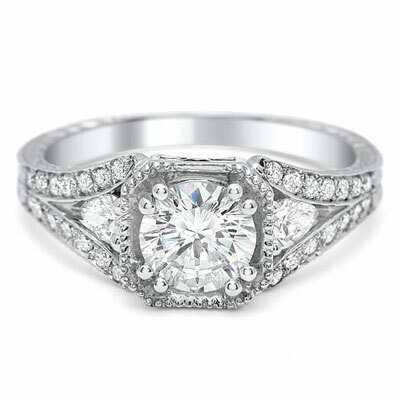 Classicly styled solitaire engagement ring with a cathedral band also featuring north, south, east, and west prongs to hold the center stone. 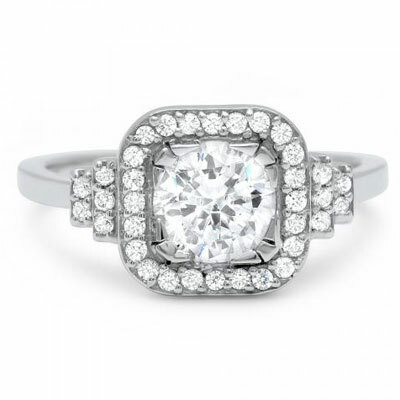 A very vintage design from days past to accentuate your center stone. 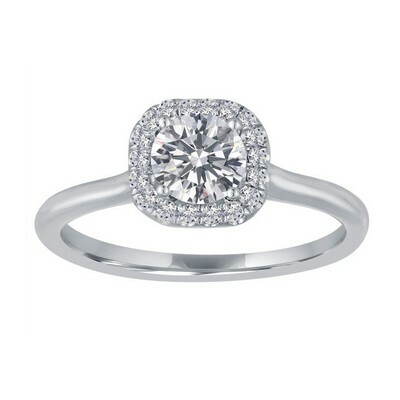 This engagement ring features .25ct in diamonds. It's time to sparkle with this stunning solitaire that features large eye catching diamonds that taper down each side of the shank. 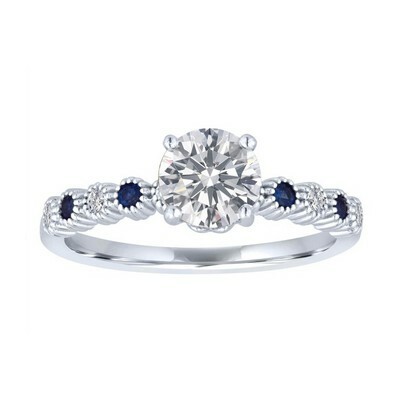 This lovely solitaire features alternating small round white diamonds and blue sapphires interlocked in delicate milgrained halos.